Implementing change in state government, as in other large public and private organizations, is an uphill battle. But productive change is feasible. In this brief, we examine how government officials in Colorado and Illinois, two states participating in the Work Support Strategies project (see box 1), seized opportunities, overcame obstacles, and led change. Both career civil servants within government and constituents outside government agree that, although state government administrations frequently promise change, they often are unable to deliver fully or, if they do make changes, subsequent administrations quickly reverse those reforms. Multiple external pressures—from stakeholders, the federal government, the courts, the state legislature, and others—can create countervailing demands that either stymie change or create many contradictory and inconsistent changes so that there is no clear overall direction. The challenges for those seeking change are many. Frequent turnover at the highest levels of state government along with complex and entrenched bureaucracies, limited funding for social and health services, and lengthy processes for changing laws and regulations can frustrate efforts to improve services and service delivery for working families. Nonetheless, strong leaders can strategically seize on external pressures as opportunities to overcome challenges and move their states in new directions. In this brief, we review the contexts and challenges specific to Colorado and Illinois. Though similar in some ways to leadership in other large organizations, leadership in state government takes place in a particular context, with its own constraints, challenges, and opportunities. We draw on the insights of state leaders as well as the perceptions of their colleagues, partners, and stakeholders to paint a picture of the leaders’ actions. We do not evaluate the actions of these leaders in Colorado and Illinois but rather use their experiences as concrete examples of state government challenges and responses to them. Drawing on these examples, we identify key lessons and strategic tools that other state government officials could apply when facing similar challenges to effective leadership of major public programs, particularly in health and human services. Work Support Strategies (WSS) is a multiyear, multi-state initiative to help low-income families get and keep the package of work supports for which they are eligible. WSS has been working directly with Colorado, Idaho, Illinois, North Carolina, Rhode Island, and South Carolina since 2011. Through grants and expert technical assistance, the initiative help states reform and align the systems delivering work support programs intended to increase families’ well-being and stability—particularly Supplemental Nutrition Assistance Program (SNAP), Medicaid and the Children’s Health Insurance Program (CHIP), and child care assistance through the Child Care and Development Block Grant. Through WSS, states seek to streamline and integrate service delivery, use twenty-first century technology, and apply innovative business processes to improve administrative efficiency and reduce burden on states and working families. We conducted more than a dozen interviews in Colorado and Illinois with agency leaders and workers at multiple levels of government, as well as community stakeholders in both states. Additionally, we drew on information gathered previously throughout the evaluation of the states’ WSS efforts. We asked those interviewed to discuss leadership broadly, the particular leadership in social services in their states, and the role that leadership did or did not play in addressing specific challenges the Colorado Department of Human Services (CDHS) and the Illinois Department of Human Services (DHS) face. We sought to synthesize the lessons about how state leaders used these specific challenges as opportunities for change and we identified potential insights and lessons relevant to state government leadership more broadly. Across the interviews we conducted with state government employees and partners, multiple themes emerged. We found three key themes for seizing opportunities to lead positive, strategic change: (1) creating a clear shared vision and showing passion for the mission, (2) building trusting reciprocal relationships inside and outside government, and (3) creating mutual accountability for shared, objective, and measurable goals. Six tools, in turn, helped leaders in Colorado and Illinois bring to fruition these key themes for leading change: (1) framing the mission, (2) communicating creatively and effectively, (3) building inclusive teams of stakeholders, (4) creating an atmosphere of transparency and honesty, (5) showing results and taking risks, and (6) establishing mutual ownership of problems and solutions amongst stakeholders through objective measurement of progress. Although these key themes and tools did not guarantee success in changing state government in Colorado and Illinois, they appeared crucial in building an environment in which change could be accomplished. Finally, we discuss the personal characteristics of the leaders. There did not appear to be any one type of successful leader. Rather, the leaders shared some characteristics but drew from different backgrounds to lead. Making meaningful and lasting change in a state government is challenging. New governors and cabinet secretaries routinely seek change, and career civil servants may attempt to make changes within their spheres of influence, yet many observe that things in government never really seem to change. One respondent, for instance, discussed how Colorado state officials had for years promised to change an application for benefits, without success. Another respondent spoke about the historical context of technology improvements in Illinois. It was “important to combat skepticism,” she said. Technology changes, she noted, “always died in process in Illinois. People half believed this would never come to fruition.” Formal studies of change in state government have often reinforced this view, finding incomplete implementation of new practices and institutions (Berman 1995; Moynihan 2006; Mayne 2007; Cohen, Eimicke, and Heikkila 2008). The frequent, built-in turnover of top leaders exacerbates the problem of incomplete change; though turnover promotes accountability and ought to drive change, leaders have little time to try to implement change. Career civil servants, on the other hand, have long memories of prior unsuccessful efforts at reform, which can leave them less motivated to push for change. Meanwhile, state leaders face strong external pressures for change from myriad actors, including Congress, federal executive overseers, stakeholders and state legislatures, which can lead to disjointed and incomplete efforts. In addition, the sheer scale of state governments is enormous, both in terms of the large numbers of staff, clients and stakeholders, and the huge stakes involved in government responsibilities. Further, the complex bureaucracies and procurement rules, in place to support government functions and integrity, can also restrict the ability of even strong leaders to change policies and procedures. For example, efforts to change SNAP policies controlling when in the month families receive their benefits involved complex coordination across multiple government agencies and cooperation with private businesses, such as supermarkets. Finally, limited funding for social services can limit options for change. Reforming social services is rarely free, and finding the funds often involves difficult trade-offs among government priorities. We asked state officials and nonprofit partners to focus on actual challenges each state had faced to make the lessons about leadership for positive change more concrete. For Colorado, we asked respondents to focus on two challenges: (1) the historic tension and lack of trust between county and state agencies and (2) the court order to improve timeliness for SNAP, Medicaid, and cash assistance in 2010. For Illinois, we asked respondents to focus on the development of Illinois’s Integrated Eligibility System (IES), an automated system to handle the applications and ongoing case management for SNAP, Medicaid, cash assistance, and other programs. Colorado’s county-administered structure allows each county to independently choose its approach to delivering work supports to eligible families, some aspects of policy, and levels of funding for administrative costs. This flexibility and autonomy at the county level has led to unique county perspectives, policies, and operations that depend on local economics, politics, leadership, and other relevant county characteristics. The governor and state agencies have limited authority over delivery of work supports. Historically, county leaders have participated in state-level decisions about program rules and the allocation of funds. However, county inclusion has not been consistent, and state transparency in procedures and policymaking has been lacking at times. Further, state staff presence in local offices and involvement in local operations in the past was limited to audits, case reviews, and various monitoring activities. As a result, the relationship between CDHS and the counties has been seen as more punitive than supportive, thereby creating tension. Since 2010, Colorado has been under a court order to process SNAP, Medicaid, and cash assistance benefits within the federally mandated time frames. The court suit arose from backlogs and timeliness issues that began when Colorado’s integrated eligibility system (the Colorado Benefits Management System) was rolled out in 2004. Flaws in the Colorado Benefits Management System design resulted in a processing backlog and the failure to provide a number of customers with their benefits. Hence, the court ordered that 95 percent of applications for benefit programs within the management system must be processed within the federal deadlines for timeliness. This mandate created significant pressure for the state to work with counties to improve the delivery of social services in Colorado. The first step leaders took was to reach out to and work with the counties to develop a plan for meeting the timeliness mandate. Multiple levels of management were brought in to examine the needs of the state and the needs of the counties, and all worked together to develop a plan. At the same time, a new data-driven management strategy, called C-Stat, was implemented to measure performance across CDHS, including the progress and success of case processing. State and county leaders now meet monthly to openly and transparently assess progress, further increasing trust. Colorado was able to meet the mandate and has greatly improved its relationship with counties. Leadership at all levels is dedicated to continuing to work on a strong partnership between the state and the counties. We discuss the tools that Colorado used to meet this mandate and improve the relationship with the counties further in the following sections. Illinois also encountered external pressure disrupting the status quo. Like many states, Illinois faced increased caseload and eligibility system upgrades tied to the Affordable Care Act (ACA). The ACA, enacted in 2010, promised to greatly increase enrollment in health insurance, including Medicaid, and offered states increased federal Medicaid funding. Following the passage of the ACA, Medicaid experts in Illinois quickly identified a significant problem: the state’s existing eligibility system, developed in the 1970s, could not manage the projected increased caseload, new rules and requirements, and database needs brought on by Medicaid expansion. As one respondent explained, “I said there is no way you are going to enroll as many people as the ACA is going to bring you unless you put in a new eligibility system; the old system can’t meet this challenge.” Illinois seized the opportunity the availability of funds offered for new technology under ACA and quickly developed a plan to create a new system—the Integrated Eligibility System (IES)—which would allow online applications and case management for SNAP, Medicaid, and the Temporary Assistance for Needy Families program. Although the ACA provided the majority of funding for creating IES, designing and launching a new system was still a massive challenge. The secretary of the Illinois DHS identified five major challenges: (1) funding, in terms of making sure that ACA matching funds could be used for the system, given competing development deadlines from the state, the US Department of Agriculture, and the Centers for Medicare and Medicaid Services; (2) partnership, in terms of bringing together stakeholders inside and outside government; (3) design, to make sure that a functional system was created; (4) communication, to explain the new system to both case workers and clients; and (5) motivation, to create buy-in among agency staff for the new system. The Integrated Eligibility System is still a work in progress. The first phase was launched on October 1, 2013. Technological glitches marred the launch and Illinois has spent months working them out. The client-facing application portal has earned high marks from advocates, and improvements are continuing on the caseworker-facing portal. The second phase of IES has been pushed back to 2015 to allow for more planning on the transfer of data between the previous (legacy) system and IES, and progress is ongoing. Overall, the people we interviewed characterized IES as mostly a success, with great strides having been made. The challenges Colorado and Illinois encountered—facing external pressures from federal government agencies and courts, developing new technologies, managing relationships between state and local agencies—are common across the six WSS states and beyond. Other states have been improving or adapting their technological systems to meet ACA mandates. And all states face difficulties in effectively and efficiently delivering social services to citizens. Using these specific challenges to focus the discussions, we asked respondents in Colorado and Illinois about the actions and characteristics of their social service leaders. In each state, we focused on two leaders, one a political appointee at the cabinet secretary level and the other a top-level operational leader.1 We also asked respondents to think about leadership in state government more broadly and to share examples of both successful and unsuccessful leadership. The three key themes for leading strategic, positive change in state government are deeply intertwined; vision cannot be separated from relationships, nor can relationships be separated from accountability. Further, these themes are not new; vision, relationships, and accountability are frequently cited in the leadership literature. However, here we see how state leaders in Colorado and Illinois employed these themes to address real-life challenges. Their examples prove instructive in translating these themes from rhetoric to action. Building trusting reciprocal relationships was another key to leading change in Colorado and Illinois. Change in state government cannot be accomplished by fiat; to work with counties and meet the court order in Colorado and to create and launch IES in Illinois, trust had to be built between individuals and between different levels of government. The prior contentious relationship between the state and counties in Colorado had resulted in a lack of trust on both sides. Similarly, in Illinois, to gain cooperation in the design and implementation of IES, trust was needed between central DHS offices, local DHS offices, and community stakeholders. All needed to trust each other to work cooperatively on this massive change of technology that would ultimately help clients. Several factors helped build these relationships, including openness and transparency on the part of leaders; a strong physical presence, which required leaders to visit county and local offices; an effort to keep promises, no matter how small; good listening skills; an understanding of both policy and practice; an effort to ensure that all stakeholders had a seat at the table from the beginning; and celebration of the initiatives’ successes. Respondents agreed that ultimately these factors improved relationships that, in turn, served the cause of change. For instance, one respondent mentioned how the Illinois secretary effectively advocated for more staffing for DHS, which was crucial in helping manage case flow and train workers in IES. Her success in this area further enhanced her credibility with the local office staff. The third key to leading positive change that emerged from our interviews was creating mutual accountability for shared, objective, and measurable goals. By creating a transparent atmosphere, where leaders, too, were held accountable, senior officials helped create an environment in which it was safe to acknowledge mistakes and to express opposition. As one official said, “The importance of humility and transparency is big, too. Effective leaders have a combination of those. [Effective leaders recognize they] are only as strong as the people around them, and I think people are responsive to that because it’s an inclusive approach.” Speaking particularly of one leader, a community partner said, “She’ll talk about if something is not working. She’s not evasive at all.” When partners trust that failures will be discussed, they put more faith in the system and believe that change is possible. This transparency further allowed leaders to learn from their mistakes and change course when needed. Accountability measures, goals, budgets, and individual performance plans, observers reported, should be clearly and directly connected to the mission and the leaders’ own values and purpose. Multiple types of goals are possible and were established in Colorado and Illinois, including data-driven goals such as the percentage of offices meeting SNAP timeliness requirements as well as smaller goals such as the keeping of meeting schedules. All involved in overcoming the challenges in these states shared in this accountability, from local offices through senior leadership, and progress was measured using transparent metrics publicly available on the CDHS website. As one respondent said, “accountability [is] a two-way street.” Leaders and staff are accountable to each other; state leaders and local leaders are accountable to each other. How are these themes for successful leadership actually accomplished? And, more concretely, how do these key themes help states overcome their many challenges? In this section, we examine specific tools that help leaders create a clear vision, build trusting relationships, and establish accountability. We illustrate how leaders in Colorado and Illinois used these tools to manage and confront their challenges. 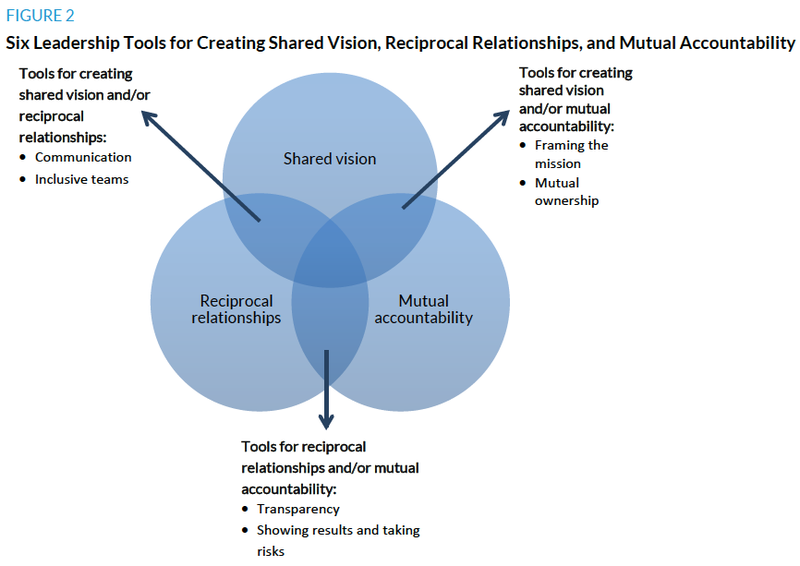 Like the key themes, the tools are intertwined and help us better understand the connections between shared vision, trusting reciprocal relationships, and mutual accountability. This sense of purpose helps workers, including frontline supervisors and staff members, to own the vision, and this ownership of the vision is necessary for change to succeed, according to those interviewed. It can help move workers from wondering why they need to make changes to excitement and buy-in for new practices. In Illinois, local office administrators helped their workers buy in to IES technology changes by explaining how the new system would make it easier for them help others. One respondent said that initially the staff resisted the change, thinking it sounded too good to be true. With more explanation of the project and vision, however, staff members became energetic and excited. Understanding the mission and purpose for the change “refueled them,” and prompted them to promote the changes to their colleagues. Communicating the vision effectively is also an important tool. One Colorado respondent said, “Previous leaders had a wonderful vision and heart but also didn’t know how to translate that to something that got people involved.” Communicating effectively first means tailoring the message to different audiences. In Colorado, one respondent referred to “painting a picture and thinking of things that would motivate people. Paint the picture of why it is important for low-income families…and always [look] for hooks that make sense to people.” In Illinois, group conversations with workers at multiple levels and with nonprofit partners “helped reframe the conversation and allowed other people at the table to frame how they thought of [vision]…. [Including other actors] served as a turning point for the group to broaden the conversation we were having about it as opposed to just how can we make this work.” In other words, the conversation about change—in this case IES—should not be just about the nuts and bolts of implementation but also about the purpose behind the implementation and everyone’s ideas and concerns. [IES] required gearing up a whole lot of people. Illinois is very big. Our eligibility staff even is 4,000 to 5,000 people. Being able to communicate that and get the word out is important for change management, but also just practically. We needed 100 [workers to test the new system.] To do that you need to communicate (1) here is the mission and vision and (2) even though it might stink, practically, this is what we need from you folks so we end up aligned. To get out the message, Illinois leadership used weekly and daily conference calls with local offices, video and web chats, Internet message boards, e-mails, and visits to regional and local offices. In Colorado, officials placed greatest emphasis on face-to-face meetings in county social services offices, which they used to demonstrate to county staff their dedication to change; this then led to, as one respondent put it, “word getting out on the street that the director cared enough to go out there.” CDHS also set up pathways through which workers at multiple levels could express their opinions and ideas about plans to change the delivery of social services. “We get their feedback on their goals and interests,” one respondent said. “They have the ability to send an e-mail and comment on a strategic plan, so it all goes into the final plans. It’s not just top down.” Responses to these outreach efforts were extremely positive; in both states, multiple respondents commented on how much they appreciated various state listening efforts. This communication, in turn, created the building blocks for effective partnerships. It was particularly important in Colorado and Illinois to listen not only to familiar voices, like close partners and large counties, but also to all stakeholders, and respondents praised leaders in these states for having an inclusive attitude when it came to participation. As one said, “[the leader’s] philosophy is inclusivity, and the counties immediately recognized that and embraced that.” This lesson was in some cases hard won. Respondents in Illinois acknowledged that not all stakeholders were brought to the table at the outset of the IES design. One respondent said, “We, as a state, missed the boat. For one reason, we allowed [the technology design] to happen at too high of a leadership level and didn’t bring in someone from the ground level who could catch those details.” This error was rectified in further meetings, and groups were created specifically to include a broader array of stakeholders, including representatives from policy and technical systems. Hence, leaders must be strategic in developing teams. Partnerships inside and outside government are crucial for accomplishing change; improving the well-being of children and families cannot be accomplished by governments alone. Both Colorado and Illinois created working groups and teams charged with developing ideas related to their challenges (meeting the court mandate and building IES, respectively). In Colorado, the working groups were explicitly led by county staff. In Illinois, both current and retired workers were brought in for different perspectives. Additionally, both states emphasized the importance of including community stakeholders throughout the process of addressing the challenges at hand. In Illinois, a Social Services Advisory Committee, composed of advocates who work with clients, meets regularly and provides information to the state about the advocates’ work and the clients’ perspectives. Similarly, in Colorado, meetings of the coordinating committee and affiliated workgroups that include state, county, and nongovernmental stakeholders provide opportunities for honest communication. I’ve found it effective to be as transparent as possible. There’s been some tough things where we don’t share details with our team because there’s no value in it, but we don’t hide anything. You talk through your decisionmaking process. You have to know your group because sometimes that won’t work—it’ll either confuse people or cause them to feel nervous about something. They can’t handle knowing there were no good choices. But it’s worked well with our team, to talk through the problem, what are solutions you could think of? At the end of the day it’s a few people who make the decision, but talking through it, you at least get buy-in. If you’re more transparent about the decisionmaking process, people appreciate being given the opportunity to weigh in. We had a paper application that was 36 pages long. The good thing about this application was that it was comprehensive, but because it was 36 pages long, a lot of people wouldn’t fill it out; they were intimidated. The state had tried for years to reduce this application. [When] I heard about this, I put a group of people together, and they came back with a recommendation to go from a 36-page application to an 8-page application. And we rolled that out by October of the first year. I was a little disappointed because I wanted to go to an online application, but we did it, and it was another indicator that we were going to be true to our word. It was a short-term win that had a huge impact on reputation. We created a performance management system we call C-Stat, which looks at our outcomes across our entire department in as close to real time as possible, and we manage to those measures. Looking at those outcomes across the state, we set measures we can all see that we are all working toward. We’re all working toward that same outcome. We could say, geez, there’s 40 percent improvement in that county compared to that county. We would not point blame, but [ask] what can we learn? How can we connect [these two counties so they can] learn from one another? There’s no way to argue when you see that county X’s performance is slipping 10 percent a month for three months, and [the executive director] or his staff follow up. And it’s a different conversation, because it’s hard data. The conversation is on a different field when you’re looking at data. C-Stat also helped reveal other challenges for Colorado, as officials noticed declining accuracy rates as timeliness improved. Colorado leaders openly acknowledged what the data revealed and began addressing the challenge in part through increased attention to data on program accuracy. Importantly, leaders too were held accountable, and that accountability was clear and unbiased. As one Colorado respondent said, “If I am not held accountable, or [I am] allowed to continually explain away unmet goals, others will quickly adopt similar rationalizing behaviors. So holding others—and myself—accountable is critical to making progress.” In Illinois, accountability was initially seen as somewhat secondary, with the first priority simply to make progress on IES. But as time passed, the two were seen as linked. Now, in weekly calls held with regions and offices, data on timeliness and other case management outcomes are shared, thereby tying progress explicitly to these markers and holding offices accountable. Accountability also means helping workers at all levels feel ownership of the change. In Illinois, the constant communication between different levels and different branches of government over IES contributed to this sense of ownership: “There was amazingly effective shared ownership that, I think, contributed to all of the success.” Ownership empowers workers to make change while holding them accountable for progress. 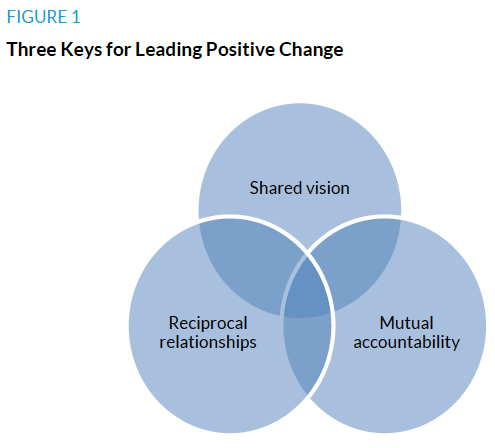 Figure 2 shows how the six leadership tools support the three key themes of creating shared vision, reciprocal relationships, and mutual accountability. For example, framing the mission in ways that remind workers how they are helping working families fosters both their shared sense of vision and mutual accountability. Showing results fosters both reciprocal relationships and mutual accountability. Creating inclusive teams of stakeholders can foster both reciprocal relationships and lead to a vision that is more widely shared. Likewise, the figure illustrates that to create mutual accountability leaders can use the tools of framing the mission, creating an atmosphere of transparency, showing results, and establishing mutual ownership through objective measurement of progress. Using these six tools—framing the mission, communicating creatively and effectively, creating inclusive teams of stakeholders, creating an atmosphere of transparency and honesty, showing results and taking risks, and establishing mutual ownership of problems and solutions through objective measures of progress—the leaders of Colorado and Illinois were able to make great strides in addressing their challenges and to make substantial changes to the delivery of work supports in their states. Of course, effective use of tools is not the only way in which leaders define themselves; personal attributes matter as well. Although the leaders in the two states vary considerably in their backgrounds, personal styles, and even approaches, common characteristics emerged from our conversations with respondents. Perhaps the most important characteristics respondents noted, were to have humility and a thick skin to cope with the criticism that comes their way. As one respondent said, “Don’t personalize it.” Instead, effective leaders are flexible; they respond to feedback by looking for ways to improve: “You need to be honest about what’s not working and willing and flexible to listen.” In Colorado, state leaders listened and responded to the concerns of counties about how they had been treated in the past; in Illinois, state leaders responded to concerns about IES and changed course when necessary. Thus, flexibility is also an important leadership quality; leaders must “have clear goals in mind but can be flexible…to deal with different things coming at you.” Leaders need to respond to criticism or challenges openly and head on, and they need to be able to change tactics or approaches when needed to reach the goal. Being a leader, respondents said, is about being present and responsive. Successful leaders also need to be empathetic. Expectations for workers are high; therefore, workers need to understand that the leaders know how difficult change is to accomplish and appreciate the effort they are putting in. A leader needs to “project empathy.” Such empathy is part of a larger set of people skills leaders require—ways of relating to workers and clients that help leaders convey their messages. Respondents identified the leaders in Colorado and Illinois as charismatic, albeit in different ways. Leaders in both states were described as people good at listening to others and good at making individuals feel heard and appreciated. These skills are crucial for leading large organizations within state government. I believe that an effective manager, leader, is just a really good social worker. You have to develop relationships, you have to develop a plan, you have to make sure the plan is achieving the results that you want, and, if it’s not, you do it all over again. I bring the skills that I learned in social work school to work every day. Effective leadership seems to be less about a particular type of training or experience and more about the ability to effectively access and implement one’s training and experiences. That is, no one type of training guarantees the skills necessary to lead. Instead, strong leaders draw on their experiences and backgrounds to plan and communicate change. They have the flexibility to apply prior lessons to new situations and to respond to challenges. What can these lessons teach other leaders and policymakers? The examples of leadership in Colorado and Illinois show that the challenges and pressures many states face can be seized as opportunities for positive change. Not all senior officials in state government are willing or able to innovate when facing challenges such as court orders or federal technology mandates. The willingness of leaders in Colorado and Illinois to see these outside pressures as opportunities to make change and their skill in integrating these outside demands into a coherent strategy and vision are critical. Change can be accomplished in state government, though it is never easy. It requires establishing a clear vision, building reciprocal trusting relationships, and creating mutual accountability for measurable goals. These goals can be reached through strongly communicating well-framed goals, practicing inclusive participation, establishing transparency and honesty, taking ownership of problems, and demonstrating gains. Change also requires a leader who is flexible, humble, and empathetic. Even more, it requires a team that works together to better deliver work supports, as these leaders and teams did to help the people of Colorado and Illinois. 1. This study focused on the following state leaders: Michelle R. B. Saddler, Secretary, Illinois Department of Human Services; Jennifer Wagner, Associate Director, Division of Family and Community Service, Illinois Department of Human Services; Reggie Bicha, Executive Director, Colorado Department of Human Services; Julie Kerksick, (former) Director, Office of Economic Security, Colorado Department of Human Services. Heather Hahn is a senior fellow in the Center for Labor, Human Services, and Population at the Urban Institute. Throughout her career, Hahn has conducted nonpartisan research on the wide range of issues related to the well-being of children and families, including cash assistance, nutrition assistance, and other supports for low-income families as well as education, labor, and other policy issues. Maeve E. Gearing is a research associate in the Center for Labor, Human Services, and Population at the Urban Institute, where she specializes in qualitative and quantitative analysis of nutrition and obesity, particularly in children and other vulnerable populations. She has worked closely with community interventions aimed at reducing child obesity, decreasing child out-of-home placement among families with unstable housing, and reducing food insecurity. Michael Katz is a research associate in the Center on Labor, Human Services, and Population at the Urban Institute, where he is involved in projects supporting and evaluating state efforts to streamline work support benefits—Medicaid, the Supplemental Nutrition Assistance Program, and child care—and examining child care policy. Ria Amin is a research associate in the Center on Labor, Human Services, and Population at the Urban Institute. She is involved in the research and evaluation of state efforts to streamline and integrate the delivery of work support benefits as well as programs designed to improve labor market opportunities within the health care field for economically disadvantaged populations as part of the Affordable Care Act. Copyright © January 2015. Urban Institute. Permission is granted for reproduction of this file, with attribution to the Urban Institute.